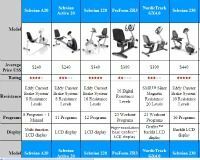 Exercise bike consumer reviews provide great insight for anyone considering the purchase of a bike. 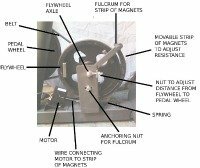 If you have had a positive (or negative) experience purchasing, assembling, working out on or maintaining your bike, here's your chance to rave or rant about it. Let us know how your upright or recumbent holds up to daily use. Does the bike perform as you expected? And if you made use of the warranty, what was your experience dealing with the company's customer service department? You have read our reviews...here's your chance to add your own comments! Please note, by submitting your review you will add a new page to this site, so make it at least 200 words or more and upload a picture of your bike. IMPORTANT: Anonymous submissions will no longer be published. Please enter your name and city/state/province in the form below (Author Information). Unfortunately we cannot delete the "optional" in the form. Enter Your Title, for example "Schwinn A10 User Review"
Do you have pictures of your exercise bike? Great! Click the button and find the first one on your computer. Select it and click on the button to choose it. Click on the links below to read exercise bike consumer reviews from other contributors.